Tuskes, P.M., J.P. Tuttle, M.M. Collins. 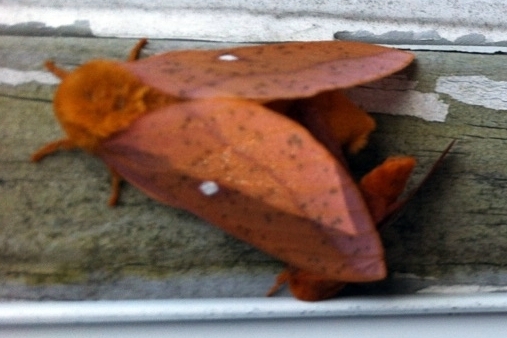 (1996) The Wild Silk Moths of North America: A Natural History of the Saturniidae of the United States and Canada. Cornell University Press. Ithaca, NY. Covell, C.V. (2005) A Field Guide to Moths of Eastern North America. Virginia Museum of Natural History. Martinsville, VA.
• Coloration: Body and wings light green. Front margin of front wings reddish to dark brown. • Coloration: Has predominantly earthtones with crescent-like markings and a stripe in the middle of each wing. The stripe has 3 color layers: black, white, reddish-orange (unlike the Columbia Moth in which the stripe is missing the reddish-orange layer). • Coloration: Wings are mostly shades of brown except for the clear circular “eye spots” in the middle of each wing. A vertical line runs parallel to the margin of each wing. • Coloration: Body is dull yellow, wings are yellow/cream and pink. There can be much variation in the intensity of the pink color, from very faded to very vibrant. 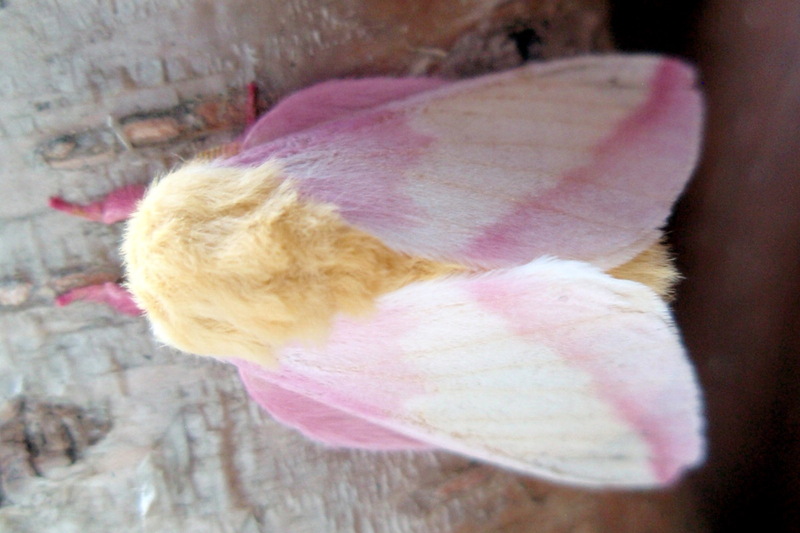 On the top wings, the yellow color occurs in a vertical band or “V”, bordered on both sides by pink. • Coloration: Predominant body and wing colors are yellow and brown. In the middle of each wing is a small circle. On the top wings, a line runs from the outer tip of the wing to the bottom wing margin. • Coloration: Predominant body and wing color is dull yellowish to beige. 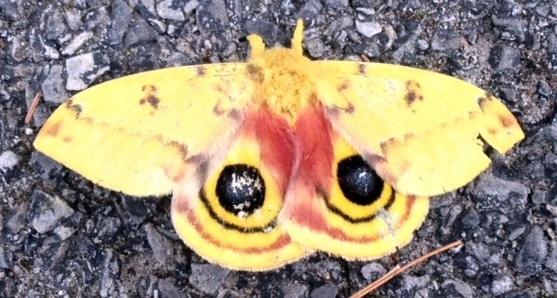 Bottom wings have large black eyespots with a light center. Bottom wings also have a black and a reddish line parallel to the bottom wing margin. • Coloration: Males and females have different body size and coloration. Females are larger with pinkish beige body and wings. Top wings each have a small eyespot near the center. On the top wing, a line runs from near the wingtip to the bottom margin of the wing. The male has a dark brown body and wings. 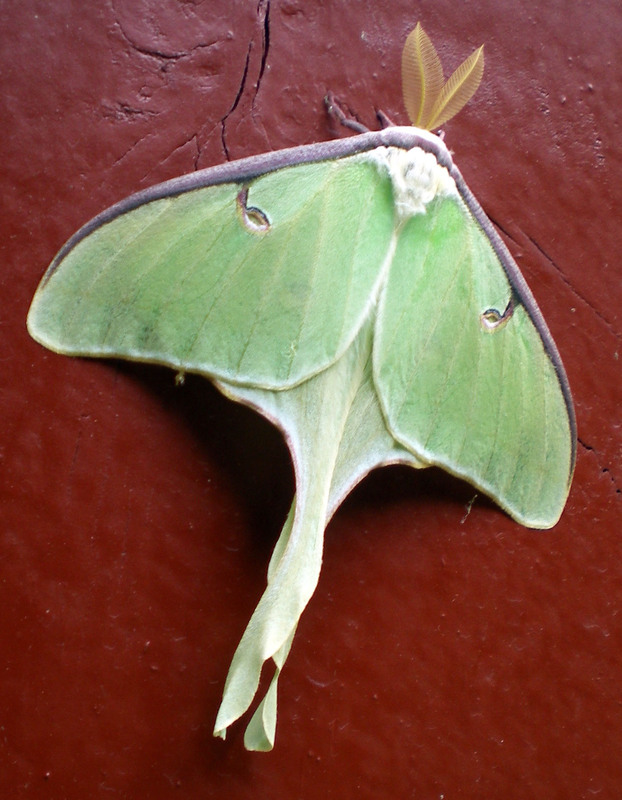 Top wings each have a small eyespot, near the edge of a large white patch. • Shape: Top wings are pointed at the tip and distinctly larger than the bottom wings, which are rounded. • Activity period: DIURNAL, active commonly in the morning. Their fast wingbeat means they can be mistaken for bees. • Coloration: Males and females have different body size and coloration. Females are larger with pinkish beige body and wings. Top wings each have a small eyespot near the center. On the top wing, a line runs from near the wingtip to the bottom margin of the wing. 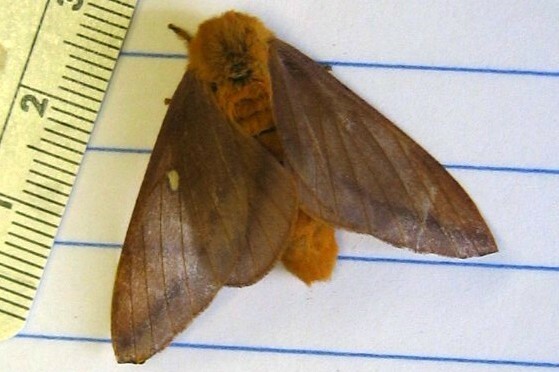 The male has a brown body and wings. 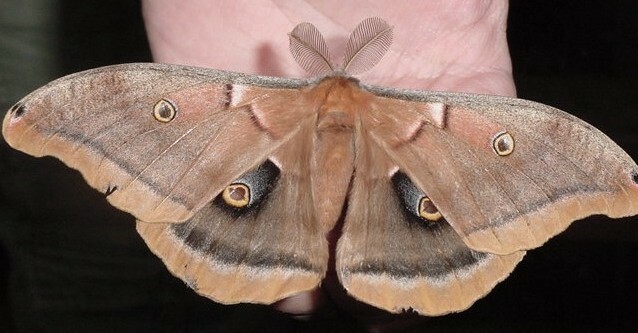 Top wings each have a small eyespot, near the edge of a large patch of lighter coloration. • Activity period: DIURNAL, active commonly in the late morning. Their fast wingbeat means they can be mistaken for bees. • Coloration: Body and wings mainly brown. Wings have crescent-like markings in the middle with a stripe below the markings. 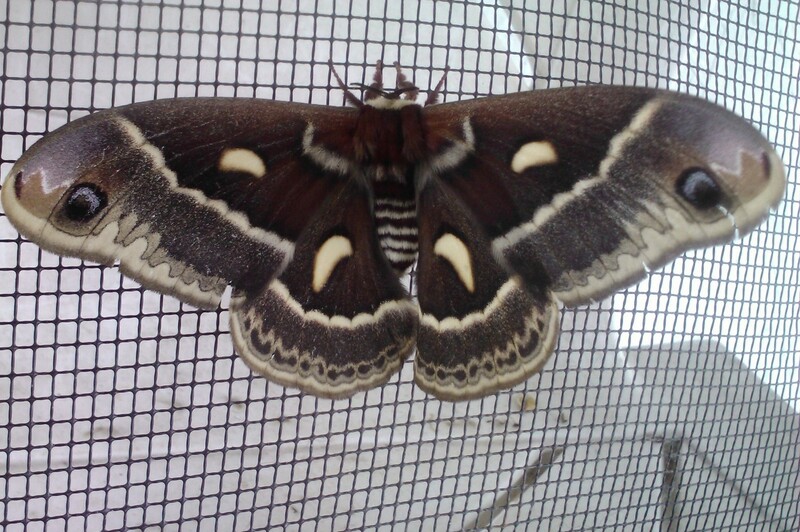 The stripe has 2 color layers: black and white (unlike the Cecropia Moth in which the stripe also has a reddish-orange layer). • Coloration: Males and females look very different. Male wings are very dark except for white/cream patterns along wing margins. Females have distinct erratic vertical line and small white/cream polygons in middle of each wing. 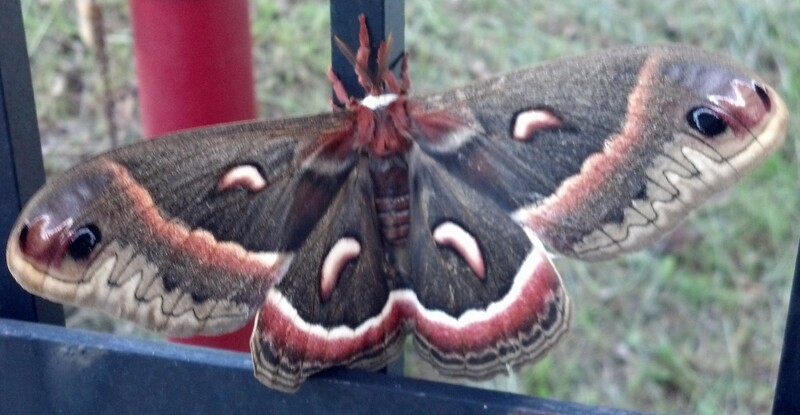 Females look similar to Cecropia Moth. 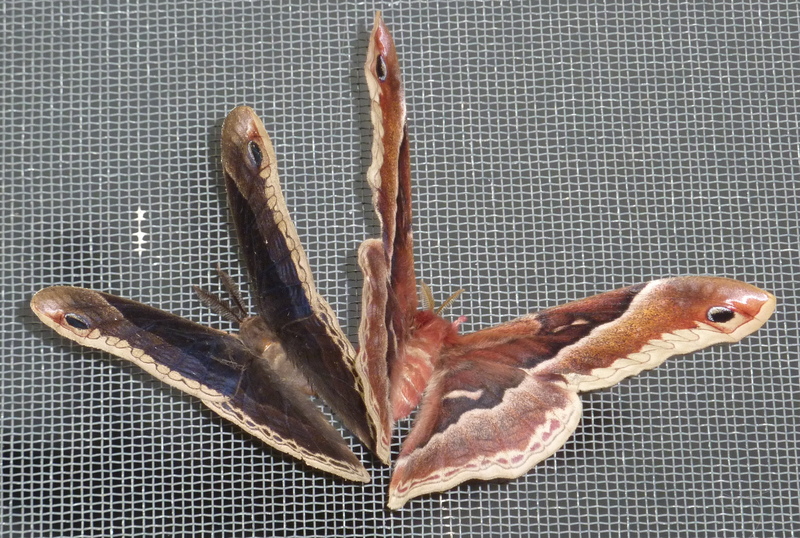 • Similar species: Tuliptree Silkmoth looks similar to female Promethea. • Similar species: Female Promethea moth looks similar but is less likely to fly at night. • Coloration: Predominant body and wing colors are orange-red and pale yellow. Wing veins are red. 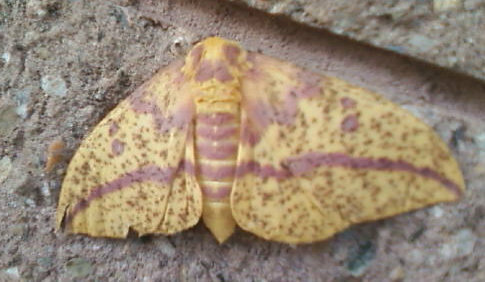 Yellow wing coloration in spots/patches on a dark background.